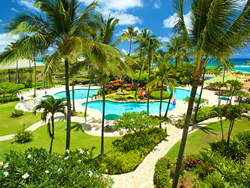 Resort for a Day has added Aqua Kauai Beach Resort in Kauai, Hawaii to its portfolio of resorts. Kauai is the perfect island for Resort for a Day because many cruise lines spend their last two days here before returning to Honolulu. Resort for a Day, the largest distributor of resort day-pass shore excursions and a division of World Travel Holdings, announced today that it has added Aqua Kauai Beach Resort in Kauai, Hawaii to its portfolio of resorts. To celebrate, the shore excursion company is offering an introductory promotion of 10 percent off all Kauai Day Passes booked through May 31, 2017. The Aqua Kauai Beach Resort is located on Kauai’s eastern shore. The beachfront resort features four swimming pools with waterfalls and a waterslide, on-site dining, spa, cultural activities, live entertainment, and much more. Resort day passes in Kauai include a $30 food and beverage credit. Resort for a Day offers resort day passes at more than 40 resorts in 21 destinations at popular ports of call giving consumers more options when choosing how they would like to spend their time at port. For more information or to book a resort day pass, visit Resort for a Day at http://www.ResortforaDay.com or call your travel agent. Travel Agents interested in selling Resort for a Day passes should visit the Travel Agent Professionals page on the website. Resort for a Day is the largest distributor of resort day passes giving cruise customers the ability to spend the day at some of the best resorts in 21 of the most popular ports of call, including Jamaica, Cozumel, Nassau, San Juan, Bermuda, St. Maarten, St. Thomas, Aruba, Hawaii and more. In addition to selling resort day passes direct to the consumer, Resort for a Day works with numerous travel agents and agencies nationwide. Resort for a Day is part of World Travel Holdings and is located in Massachusetts. For more information, visit http://www.ResortforaDay.com. World Travel Holdings is the world's largest cruise agency and award-winning leisure travel company with a portfolio of more than 40 diverse brands. In addition to owning some of the largest brands distributing cruises, villas, hotels, resort vacations, cars and luxury travel services, World Travel Holdings has a vast portfolio of licensed private label partnerships comprised of top leisure travel providers, including almost every U.S. airline, leading hotel brands and prominent corporations. The company also operates a top-rated travel agency franchise and the country's original host agency, and is consistently recognized as an industry leader in work-at-home employment. Its global presence includes operating multiple cruise and vacation brands in the United Kingdom. World Travel Holdings has offices in Long Island, NY; Wilmington, Mass. ; Ft. Lauderdale, Fla.; Virginia Beach, Va.; Chorley, United Kingdom and Southampton, England. For more information, visit WorldTravelHoldings.com.